Research by McKinsey around how workers communicate and collaborate using social technologies designed to boost productivity and interaction is quite interesting. It broke down the average workweek by percentage and found the top three were role specific tasks (used up about 39% of the time), reading and answering email (28%) and searching and gathering information (19%). Coming in dead last at only 14% was communicating and collaborating internally. Imagine the impact on your bank if you could get collaboration moved higher on this list. Running any business, including a bank, is a collaborative effort. 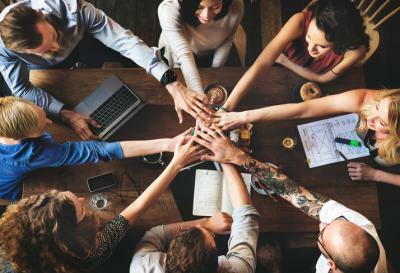 That is why it is a bit concerning to find that a survey of executives by Strategic Retreats finds 96% say a lack of collaboration is a main reason for "workplace failures". To fix this, consider taking a different tactic perhaps. Encourage your teams to tell the top leadership at your bank when they have fresh ideas, concerns or ideas to drive the business forward. Managers that are too nervous to say what they think are more likely to say nothing, leaving management teams to shout into the wilderness only to hear their own voice echo back. Harvard Business Review recently captured the idea of creative collaboration in one of their articles and we thought it would be worth highlighting. Banks thrive when there is professional discord and differences of opinion. The goal is not to create hostility, but to build trust that allows everyone to speak freely - even if they don't agree with management. Ideas are more easily inspired and developed this way. For instance, a top manager who doesn't listen to his or her personnel will end up not only disconnected, but also left trying to solve important business issues in a vacuum. Meanwhile, employees that don't have their voice heard will be driven to seek employment elsewhere. One of the quickest ways to jumpstart a highly collaborative environment is to tell managers that you want one. Next, you have to show everyone that you mean it. Teambuilding is one way to kick this off as it helps to make the group feel comfortable sharing differing points of view. Third, when people disagree with a position, embrace it. Having countering viewpoints, as long as they are offered in a professional manner, are very beneficial when the management team is trying to tackle tough issues. Fourth, be sure to enable all of your reports to think outside of the box, to speak their minds and to question the status quo. This empowers everyone and makes them feel more supported in their roles. That in turn, builds trust, passion and it makes employees feel like an integral part of the team. Another tip to build more creative collaboration is perhaps to assign certain roles during meetings. One is the devil's advocate, while another is the logical thinker. Yet another might be the traditional thinker or perhaps a provocative thinker. Having these different roles allows you to thoroughly discuss new ideas from a variety of viewpoints, without forcing anyone to personally take a differing view. No matter how you approach communication and collaboration, know that it can deliver real value and is worth the effort. Consider that research by Source Consulting finds 75% of employers say teamwork and collaboration is very important but almost 40% of employees say their teammates don't collaborate enough. That hurts the bottom line, because 97% of employees and managers say lack of alignment in a team negatively impacts a task or project outcome. Finally, the research finds 99% of people prefer a workplace where people identify and discuss issues truthfully and effectively, so everyone seems to want this. Bankers can always do more, so perhaps it is time to take another look at how your teams collaborate - team by team. Yields flopped 4bp, hitting the lowest level since Mar 1, amid growing concerns of the implementation timetable of Trump's pro-growth policies. Bank of America research finds 61% of this age cohort use ATMs to withdraw cash vs. only 15% who use a teller. Korn Ferry research finds the top 5 competencies found in the financial services industry of C-suite executives that rank highest at staying ahead of lower engaged executives are: the ability to persuade, managing ambiguity, being resilient, ensuring accountability and nimble learning. How does your team compare? Fed research finds CRE concentrations to capital have moved higher over the past 3Ys. Regulators are closely monitoring this and in particular looking at concentration levels and trends, potential competitive easing of underwriting standards, and elevated property prices. Regulators warn banks to understand the potential negative impact a rising interest rate environment could have on debt service coverage ratios on variable-rate commercial mortgages and property prices. Bankers may find it interesting as you monitor ever-changing customer behaviors that the number of people who filed self-prepared taxes electronically last year climbed 5.4% to 53.1mm vs. the prior year. Meanwhile, the percentage of people who filed online using a professional tax preparer was almost flat YOY at 78.7mm. Zillow research finds technology workers in Seattle, WA keep 59% of their pay after housing and tax costs vs. only 37% for the same type of worker in San Francisco, CA. Facebook research finds 18% of small businesses say they are engaged in international trade.